Improve your communication with your customers, colleagues and partners and interact with them personally and effectively. Let them contact you anytime or run engaging marketing campaigns, loyalty programs, polls/surveys, sweepstakes and so much more, through a single connection point of AMD Telecom. You are free to run multiple campaigns on a single provided number, reducing your costs and administration. Avoid unnecessary complications with multiple numbers and keywords. Set up auto-responders and reply automatically with dynamic content, activated by predefined keywords and action triggers. All responses can be configured via API or into our web platform. Send and receive messages in any language you want. We support Unicode, so you can communicate in any language (Chinese, Japanese, Arabic, Greek and so on…). We believe that interactive communication should not be limited to 160 characters. 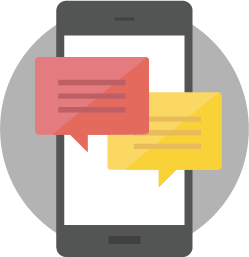 For that reason we support SMS concatenation, being able to send and receive long SMS as a single one. You can track every sent or received message in real-time that enables you to confirm message statuses and impact. You may extract reports based on your criteria. Let your users/customers opt in or out of your campaigns easily, with a single click. The process is configurable upon your needs, through API or web platform. Open up an interactive line of communication with your users, existing or potential customers, anywhere in the world. Lower communication (outbound or intra-company), customer care and advertising costs. Instant, measurable impact and effectiveness of messages, with increased Return On Investment (ROI). Lower administrative cost of your application, as everything is monitored and replied through a single panel. Get instant feedback of your users/customers. The service is scalable on demand (increased or reduced usage) so you don’t have to worry about hardware additions, upgrades, etc.